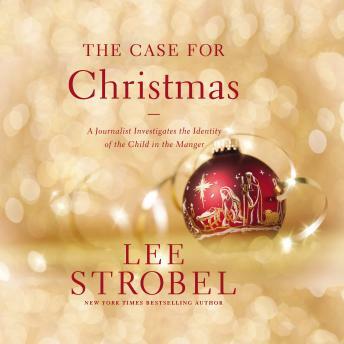 Says Lee Strobel, the author of The Case for Christmas:Who was in the manger? Even after two millennia, controversy continues to swirl around the Christmas child. "Scholarly debate is intensifying over who Jesus actually was: divine, human, or both?" said a recent article in The Chicago Tribune. "Jesus has been portrayed in a burst of books as, among other things, a Cynic philosopher, an apocalyptic prophet, a zealot, a rabbi, a Pharisee, a feminist, a radical egalitarian, and a postmodern social critic. "Like countless other children, I listened with rapt fascination each year to the traditional Bible story about Christmas. But as I matured, skepticism set in. I concluded that not only is Santa Claus merely a feel-good fable, but that the entire Christmas tale was itself built on a flimsy foundation of wishful thinking.All of that changed, however, after I took a cue from one of the most famous Bible passages about Christmas. The story, recorded in Luke 2:8-18, describes how an angel announced to a ragtag group of sheepherders that "a Savior who is Messiah and Master" had been born in David's town. Was this a hoax? A hallucination? Or was it the pivotal event of human history - the incarnation of the Living God?The sheepherders were determined to get to the bottom of the matter. "Let's get over to Bethlehem as fast as we can," they said, "and see for ourselves what God has revealed to us." They left, running, to personally investigate the evidence for themselves.Two thousand years later, challenged by my agnostic wife's conversion to Christianity, I also undertook an urgent mission to determine the true identity of the child in the manger. Through interviews with scholars and other experts, I sought to resolve the question best posed by Jesus himself: "Who do you say that I am? "The Case for Christmas retraces and expands upon my journey by delving into the roots of this most cherished holiday. Can we believe in our scientific age that Jesus was really born of a virgin? Is there astronomical support for the mysterious star that led three individuals to the newly born "king"? Does history support the Bible's claim that a Roman census sent Mary and Joseph to Bethlehem or that Herod the Great ruthlessly slaughtered the children of that rural village, seeking to destroy his supposed rival? Did Jesus match the prophetic "fingerprint" of the Messiah? And did he manage to fulfill the attributes of God? By focusing on the "hows" and whys" of Christmas, this warm yet journalistic book will help believers reaffirm their faith while guiding seekers as they pursue solid answers about this miraculous occurrence. The evidence is in. The verdict is up to you.